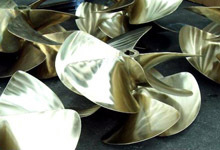 Watson Marine supplies propellers for all types of inboard installations ranging from high performance sports cruisers and motor yachts through to sailing yachts, leisure craft, ski boats, commercial fishing vessels and workboats. Watson Marine has access to a wide range of both Australian & International brand propellers including Austral, Veem and Faster. 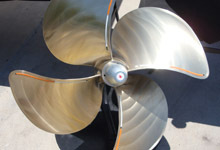 Mercury, Volvo & Solas propellers are also available for inboard, outboard & stern drive applications. If a new propeller is not in your price range, we have a large range of second hand propellers available in stock. Featuring world class Computerised Propeller Scanning Equipment on site at our Coomera workshop, Watson Marine has the leading technology to ensure the propeller fitted is allowing your vessel to run at its best. 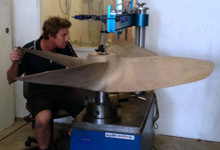 No need for expensive transport or shipping costs, all propeller repairs & alterations can be done by our professional Propeller Technicians at our Gold Coast workshop. 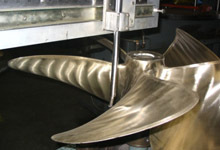 Much like a car engine, propellers should be periodically serviced to achieve & maintain optimum vessel performance. Any damage or distortion to a propeller can cause vibration, loss of speed, increased fuel usage & engine or drive train damage. 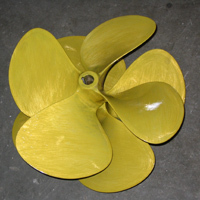 Next time your vessel is out of the water have your propeller scanned, straightened & balanced. Propeller scan reports are available upon request Free of Charge to keep in your vessel file for future reference. 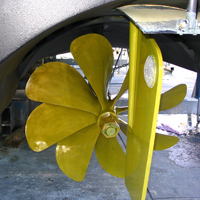 In the unfortunate event of a run aground or contact with a submerged object Watson Marine can assist with all your propeller repairs. We are a preferred Insurance repairer & have associations with Club Marine, Nautilus & NRMA assessors. 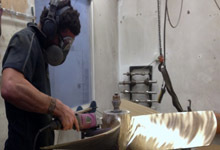 We have onsite Tig & Mig welding facilities at our workshop if the propeller edges need some repairing or building up. As a result of our ever changing climate, combined with several other factors we have seen an increase of propellers coming in with electrolysis damaged. Electrolysis is the chemical reaction caused by different metals placed in a conductive liquid. Electrolysis is identified as pin head to fingernail sized crater holes & can affect both the boss & blades of a propeller. 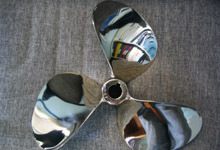 If this issue is not rectified it can prove fatal for your propeller. Watson Marine can fill Electrolysis holes using a specialized mixture of epoxy & aluminum bronze filings. The filling of electrolysis holes is mainly performed for aesthetic reasons but also aids in prolonging the life of an electrolysis affected propeller. Watson Marine is an Approved Prop Speed applicator. 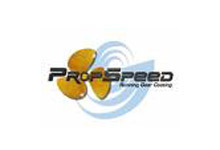 Prop Speed is a silicone based antifoul system that can be used on all types of metal. Prop Speed resists all type of marine growth. When the product has dried to the surface, it has the same effect as a piece of glass. Although some marine growth will still form on Prop Speed when stationary for long periods of time, once the propeller begins to spin under power, any build-up will come off the Prop Speed. Already being used on thousands of boats worldwide, from small pleasure boats through to large super yachts and commercial boats, this is the ultimate protector. All reports to date have shown that engines can rev 300-500 revolutions higher than other antifoul systems, increasing both boat speed and in turn fuel efficiency, making Prop Speed a viable investment.